Living for over a month in the Little Red Dress helped me understand this: Less REALLY is more. 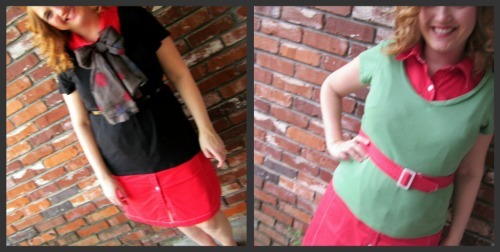 When I only had the option of one dress, it cut my outfit decisions down to a bare minimum. In fact, I took everything out of my closet and only put clothing back in I knew would go with the little red dress. 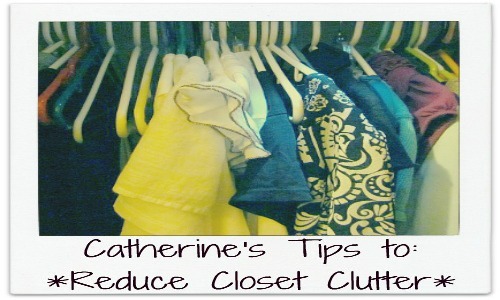 It made my small closet roomier and outfits easier to find. After the experiment ended and I started putting clothes back in my closet; I was overwhelmed with the amount. Evaluating them before putting them on the rack, I discovered there were many items that didn't fit right, or that I didn't love. I just started tossing into the giveaway bag. 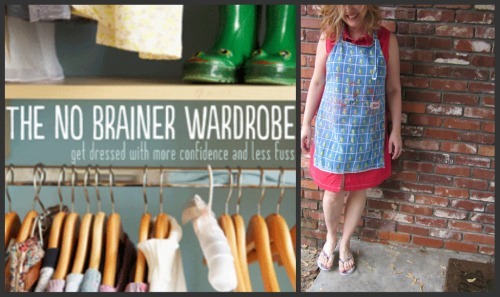 I happened to discover The No Brainer Wardrobe *ebook right about that time and it helped my decision-making process immensely! Tip #1: Get rid of EVERYTHING you don't feel completely beautiful in. You might think this is extreme but honestly, are you going to wear it if you feel slouchy or ugly in it? No. And if you're struggling to let go, consider this: you'll pull on that piece of clothing and spend your day uncomfortable because you feel slouchy or ugly. We don't want that! So pleeeeease toss it. Remember that someone else could find it and love it; then you're helping them feel beautiful! Let's Chat: Do you toss unused items naturally? Or is it difficult for you to get rid of things you've had for awhile? *Note: Buying from this link will give me a small commission. I have only signed up to be an affiliate for four items in the lifetime of my blog and I don't take the decision lightly. I bought this ebook, thoroughly enjoyed the lessons and happily recommend it. I don't find it difficult to toss items I haven't worn. Clothing really can be indicative of who we are, and how we feel, and I like putting on pieces that help accomplish that. This doesn't surprise me about you, Joanne! You seem like a no-nonsense kind of gal. Doesn't it? I love not having my closet crammed with stuff. I am a MASSIVE hoarder. That combined with my general indecisiveness means… well you can imagine what that means for my wardrobe. I keep items I like regardless of whether I like the way they look on me. I keep items I think will come back into fashion "one day". I keep items of sentimental value. Sometimes even if it has a tear in it I keep it because I'm convinced "it adds character"
Its so silly but I feel safe with all those clothes there, like if I threw them away suddenly I'd have nothing to wear even though i don't wear them anyway… (I'm realising how ridiculous this sounds even as I'm writing). You're totally right and I know it but maybe that book would give me the kick in the bum I really need. My name is Kat and I'm a clothes-a-holic. This made me smile. I love your honesty. I'm thinking you shouldn't pressure yourself to toss yet. Maybe just boxing up what you don't wear so you still have the safety of it being around but yet your closet won't suffer from being overfull. I usually get rid of a few things each season change-over. My closet is still too full. It's pretty small. I have too many dresses/skirts. I don't really enjoy wearing them and typically only do on Sundays. I'll have to take another look, but then again, I haven't switched over to summer clothes yet either. I'm intrigued by your new series. Yay for being inspired! Just remember, you don't have to get rid of everything at once. Just work at it little by little and eventually you'll have more space. Good advice Catherine. My habit is to donate anything I have not worn for a year. I do keep the special clothing a bit longer if I paid a lot for it. And I totally agree...if it a so so outfit, why bother? I've gotten really good at keeping my closet free of things I won't wear or no longer like. It feels good to donate them or make some extra money by consigning them. The ebook sounds interesting! I'll have to check it out.